How do you listen to music? Maybe you plug in your cell phone and let Spotify curate a playlist for you? Or, perhaps you prefer listening to a satellite radio service like SiriusXM? Regardless of what your preferences are, more than likely, you're embracing the digital age with your listening device. However, if you're old school, enjoy more lo-fi listening or nostalgic, next time you want to jam out, turn the radio dial on, and you may be surprised at what you find. FM (which stands for frequency modulation) radio stations are top notch across the Oklahoma City metropolitan area, with local DJs (disc jockeys) that are not only passionate about radio but the entire state of Oklahoma. The simple fact is that you won't find personalities like this from an algorithm or a DJ that is located halfway across the country. The local stations in the city span the gamut from rock to country, to top 40 hits, hard news stations, sports commentary, religious and devotional stations, and many more. The stations are arranged in ascending order by their call numbers. Operated by the Oasis Radio Network, KMSI - 88.1 is a religious station that broadcasts spiritual music, Bible study programs, and interviews with prominent members of the Christian faith. Known as "K Love," KYLV - 88.9 focuses on contemporary Christian music that is suitable for both children and adults. You can also find this station on 103.7 in nearby Edmond. KXTH - 89.1, "The House" focuses on contemporary Christian music as well as motivational programming. Even if you're not a Buddy Broncho you can still enjoy the University of Central Oklahoma's broadcast on KUCO - 90.1 from the school's campus in Edmond. KUCO plays classical favorites that span across central Oklahoma, and much of southeastern and northwestern Oklahoma via the stations KBCW 91.9 FM in McAlester, and KCSC 95.9 FM in Woodward. KOKF - 90.9, "Air 1" plays "Positive Hits," primarily consisting of contemporary Christian music. KOSU - 91.7 / 107.5 is a public radio station that has been around since 1955. A Tyler Media property, KOMA - 92.5 plays the oldies-but-goodies from the 1960s and 1970s. Known as "The Brew," KBRU - 94.7's focus is on contemporary alternative rock hits. KXXY - 96.1 is a favorite among country music fans, and one of the best stations in the area for classic country hits. KKNG - 97.3 was formerly a country music station but switched to broadcasts tailored to members of the Catholic faith. WWLS - 98.1, known as "The Sports Animal" is a Cumulus station, and one of Oklahoma City's top stations for sports talk. Due to its live broadcasts, it's a very popular station among basketball enthusiasts, particularly Oklahoma City Thunder fans. 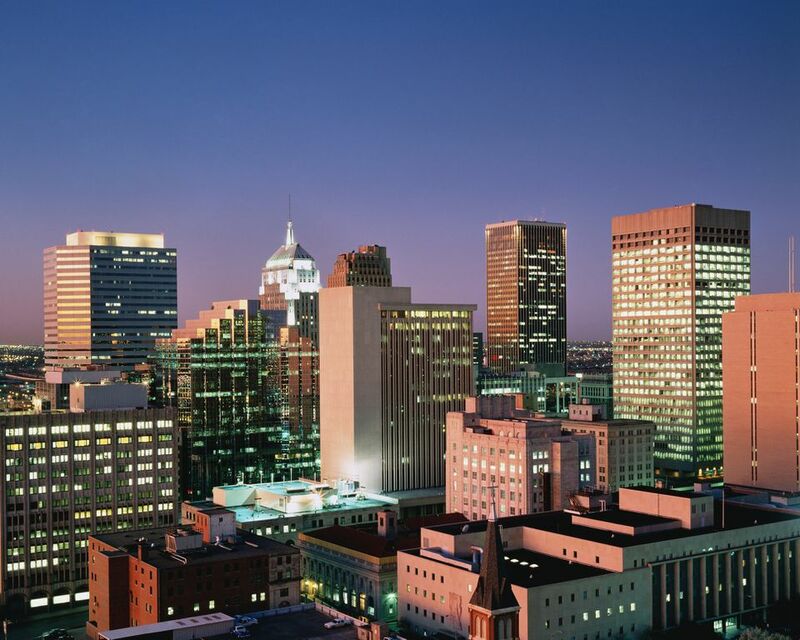 A longtime OKC favorite, KYIS - 98.9, "Kiss FM" plays adult contemporary music, soft rock, and top 40 hits. KATT - 100.5 calls themselves "Oklahoma's Pure Rock Station." The KATT plays both new and classic rock tunes. KTST - 101.9, "The Twister" focuses on new country hits from favorite artists like Brantley Gilbert, LoCash, and High Valley. KJYO - 102.7 is known as "KJ 103," the station plays Top 40 hits. Not surprisingly, it is one of the most listened to stations in the metro area. KVSP "Power 103.5"'s format is urban contemporary, playing both local and national hip-hop and R&B favorites. Consistently one of the higher rated radio stations in and around Oklahoma City, KMGL - 104, or "Magic 104" plays adult contemporary tunes starting from the 1970s until today. To celebrate the holidays, the station plays Christmas music around the clock beginning just before Thanksgiving. Branded "Wild 104.9," KKWD - 104.9 plays contemporary hits with a focus on pop, dance, and Electronic dance music (EDM). Formerly a station that played Mexican regional tunes, KINB - 105.3 is now a CBS Sports affiliate radio station that broadcasts National Collegiate Athletic Association (NCAA) football, baseball, and basketball games, National Football League (NFL) games, National Hockey League (NHL) matches, Major League Baseball (MLB) games, and more. KWCO "Kool 105.5's" specialty is playing classic hits from the 1960s, 70s, and 80s. KGOU - 105.7 and 106.3 is a National Public Radio (NPR) source and is licensed to the University of Oklahoma campus in Norman. KIRC - 105.9 the "Real Country" station broadcasts a wide range of country music favorites. A part of Tyler Media, KTUZ - 106.7 is a Spanish-speaking station that plays hits from popular artists from Mexico. KRXO - 107.7's is classic rock station that allows listeners to "Pick the Rock" by voting on what songs they should play each day.